In SS2018, Kanebo changed their sunscreen, Allie good reputation among Japan. The biggest change is “Friction Proof”. I am the person who sweat really a lot, and made my clothes damaged often by my sweat and sunscreens. I jumped this Allie Extra UV BB Gel, due to the strong SPF 50+, PA++++, Waterproof, and Friction Proof effects. And it is also true that this BB is often ordered among us. But to going to ship the products to the post offices? or walking? Probably, using Excia foundations are too much to using for my activities. So, I changed my mind, and bought this BB. Let me show you my review. Actually I had used some “BB” or “CC” things but the shade is a kind of wired, grey or something. But seems this BB cream by Allie, the shade is natural. Blending on my arm, the shade is a little bit too white for my skin. Indeed when you use this as the a primer, it is not pretty bad. They claim this BB is pore covering and good lasting. On my face, I felt there are no irritation, I often feel sting by sunscreens. It is a wonderful point. The second is there are no perfume nor scent. It is great. The covering is medium to full, I felt, and I did not feel this BB is emphasis my pores on nose, but not covering well, as I had expected. In this point, I should not to do that, I am using high end foundations as daily, not BB. I am not feeling my skin is moisturised by this BB, they claimed they are using skincare ingredients ( but not so much sure which one they are talking about). I felt my skin is powdery. There are no “radiant” finish, but some may say “matt”. My favourite finish is natural to semi-matte. It is too matte finish for my preference. The lasting is not pretty bad. When I use weak lasting products, my makeup are melting in the first one hour. It never happened in this BB. But I never say it lasts whole a day, you know, this is a BB cream, and I guess this is not for the using of that way. OK, let me spray Avenne Water on my arm. In the upper picture, I felt actually the waterproof effect is less than I had expected. The bottom of the picture above, I wiped my arm by towel. When my arm is not wet, when I touch my face by tissue, there are nothing on the tissue. Not pretty bad. So, if you rarely sweat a lot, it can be not bad. I had used ADDICTION Skin Protector, as primer & sunscreen, but in this year, I may use this Allie BB for my primer & sunscreen. 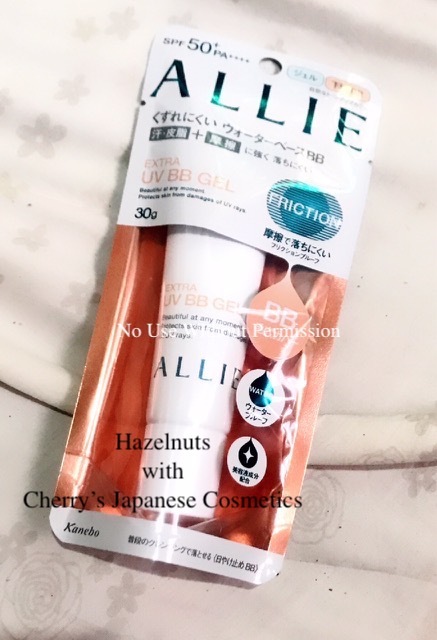 Here’s my experience using the Kanebo Allie Extra UV BB Gel SPF 50 PA++++. It’s my first time to use this brand of sunscreen. What attracted me to the brand is the so-called “fiction-proof” technology that supposedly forms a protective veil over the skin to counteract oil, perspiration water and even day-to-day activities. I was very eager to try it out, due to our high humidity, high heat environment. I have combination skin right now and I used this UV BB Gel as my base/tinted moisturiser daily for two weeks. I like how it is water based. When spread onto the skin, the texture is moisturising enough for me. The tinted formula has a slight brightening effect and provides me with very good coverage. I can wear this alone without any other makeup, other than a sunscreen underneath, because I like to layer my sun protection. But take note that I do not have pimples or dark marks or freckles on the face, only some slight redness. I suppose the coverage of this one is still sheer, but works enough for me. Once it dries, the coverage pretty much lasts all day, even through extreme heat. I tend to sweat a lot and this sunscreen does hold up pretty well. I was very impressed. I do not have to put on a lot of makeup and this makes me look polished for my everyday activities. This is a very good tinted moisturiser/sunscreen that feels lightweight, is reasonably moisturising and provides good coverage. Works great for daily use. I am sure it would work well across all skin types, even with oily skin.